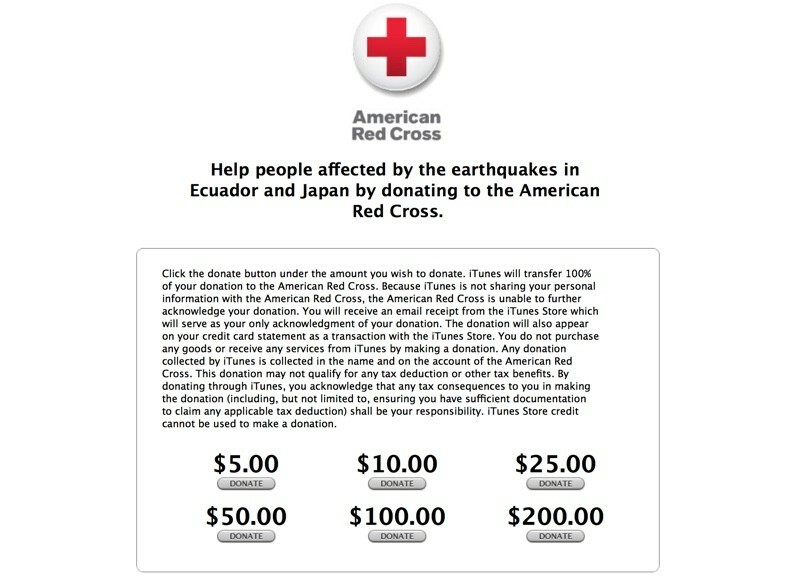 Apple today added banners to the iTunes and App Stores allowing customers to donate to the American Red Cross in support of people affected by the earthquakes that hit Ecuador and Japan last week. 48 people have died in Japan and thousands more were injured after magnitude 6.2 and 7.0 earthquakes hit southwest Japan on April 14 and 16, causing severe damage in the Kumamoto and Ōita prefectures. More than 140 aftershocks have also affected the region. In Ecuador, a magnitude 7.8 earthquake hit approximately 110 miles from Quito on April 16, killing more than 500 people and injuring thousands more. Apple has used the iTunes Store donation method multiple times in the past to raise money for charity, most recently accepting donations in September to support the refugee and migration crisis across the Mediterranean Sea and Europe. Other previous relief effort fundraising campaigns have included the 2015 Nepal earthquake, the 2013 Phillippines typhoon, Hurricane Sandy in 2012, the 2011 Japan earthquake and tsunami, and the 2010 Haiti earthquake. This would be great if the American Red Cross wasn't a total sham. For those who may not be aware, here's an article with some of their past problems. Hopefully they've been doing better the past few years, but Doctors Without Borders is still the charity I trust for tragedies like this. Congratulations. Three whole posts before someone went negative. Nice. Updated my post to offer an alternative. Red Cross doesn't know how to manager their money. Maybe you're okay with that but some aren't. I'm just pointing that out and providing an alternative. Not negative, just wise. It wasn't just the home-building results that turned me off to the RC, but all of the other support work they just didn't follow up on. There's no way that my money is getting funneled through those, well, I can't type here what I'm thinking about the Red Cross... This last bit is IMHO. Doctors Without Borders gets my funds to assist with these disasters. I'll donate if Apple matches my donation. Thank you so much! I live in Ecuador and every bit of help is deeply appreciated. Don't give to the Red Cross; you'd be better off burning your money. They're this close to being a scam. And I donate blood regularly (different division). Did you just excuse Apple's tax evasion? No, but I also don't plan on withholding donations from people in Japan and Ecuador because I didn't like something that a company in America did. Ah, you know what? You show Apple. Your noble and selfless refusal to show financial support of natural disaster victims will surely be the catalyst of change in Apple's corporate culture. You, sir, are the victor. Wasn't there a big scandal with the Red Cross' involvement in the Haiti Earthquake when it was found that digital donations didn't make it to the needy? Don't donate to the Red Cross - they are thieves. I learned how corrupt the Red Cross was living in TriBeCa after 9/11. I posted about it here but all I got was flak. I'm amazed at how all of a sudden the public has become so accepting of conspiracy theories.